Cast jaws and a high-impact handle. Soft plastic jaw guards help prevent damage to surfaces. 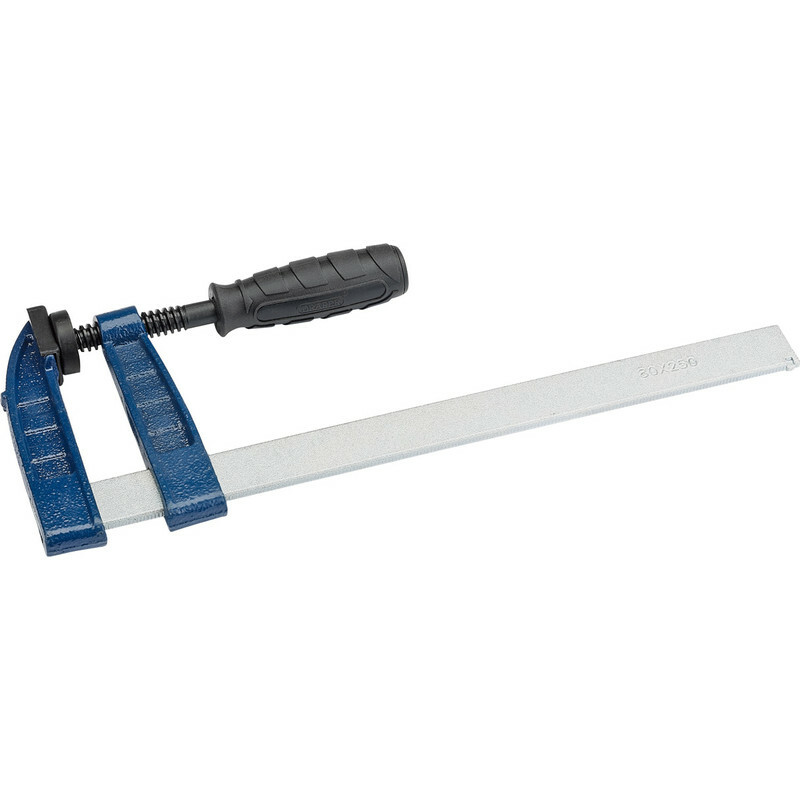 F Clamp 500 x 120mm is rated 4.8 out of 5 by 17. Rated 5 out of 5 by Luckymusher from Small but strong and durable. Suprised at the size of these clamps when they arrived. But that proved to be to their strength. Easy to slip into awkward places and strong enough to hold fast until permanent fixings put in place. A third pair of hands. Rated 5 out of 5 by Rob14 from Excellent Bought to do a specific job which it did perfectly. Will use for many more tasks in the future. Rated 5 out of 5 by MetalMania from Great F Clamp These are Draper F Clamps, so as you might expect they are very sturdy and good quality, the main bar being polished steel and the sliding arms black steel. The plastic protective caps were all in place, unlike some of the other reviews here. I needed a good depth to the clamp and these were perfect for the job (holding in place UPVC window frame in a door while adhesive/sealant set) the 120mm width refers to the measurement from the inside of the main bar to the center of the bracing screw, so ideal for my needs. Great addition to my tool set. Rated 4 out of 5 by M I C K from It's a clamp. Good value for money, does what you would expect. You will loose the plastic pads in time though as do come of easy not that it makes much difference to the efficiency of the clamp. Second set I've purchased as needed 4. First set still going strong after a number of years ( minus the plastic pads). Rated 4 out of 5 by euanmr from Replacing old worn clamps Seem robust enough, well priced and sizes are similar to my old ones.